Knowing the tumor’s size and location, could we target treatment to THE ROI by applying imaging-guided intervention? Advances in techniques for cancer lesions’ detection and localisation [1-6] opened the road to methods of localised (“focused”) cancer treatment [7-10]. An obvious challenge on the road is reassuring that the imaging-guided treatment device indeed treats the region of interest and preferably, only it. 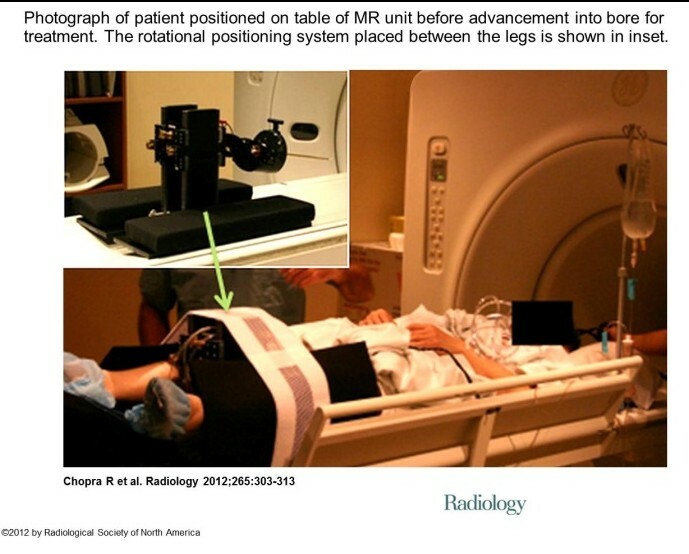 A step in that direction was taken by a group of investigators from Sunnybrook Health Sciences Centre, University of Toronto, Ontario, Canada who evaluate the feasibility and safety of magnetic resonance (MR) imaging–controlled transurethral ultrasound therapy for prostate cancer in humans . Their study’s objective was to prove that using real-time MRI guidance of HIFU treatment is possible and it guarantees that the location of ablated tissue indeed corresponds to the locations planned for treatment. Eight eligible patients were recruited. WILKINSON (L.S. ), COLEMAN (C.), SKIPPAGE (P.), GIVEN-WILSON (R.), THOMAS (V.). Breast HistoScanning: The development of a novel technique to improve tissue characterization during breast ultrasound. European Congress of Radiology (ECR), A.4030, C-0596, 03-07/03/2011. Hebert Alberto Vargas, MD, Tobias Franiel, MD,Yousef Mazaheri, PhD, Junting Zheng, MS, Chaya Moskowitz, PhD, Kazuma Udo, MD, James Eastham, MD and Hedvig Hricak, MD, PhD, Dr(hc) Diffusion-weighted Endorectal MR Imaging at 3 T for Prostate Cancer: Tumor Detection and Assessment of Aggressiveness. June 2011 Radiology, 259,775-784. Wendie A. Berg, Kathleen S. Madsen, Kathy Schilling, Marie Tartar, Etta D. Pisano, Linda Hovanessian Larsen, Deepa Narayanan, Al Ozonoff, Joel P. Miller, and Judith E. Kalinyak Breast Cancer: Comparative Effectiveness of Positron Emission Mammography and MR Imaging in Presurgical Planning for the Ipsilateral Breast Radiology January 2011 258:1 59-72. Eggener S, Salomon G, Scardino PT, De la Rosette J, Polascik TJ, Brewster S. Focal therapy for prostate cancer: possibilities and limitations. Eur Urol 2010;58(1):57–64). Rajiv Chopra, PhD, Alexandra Colquhoun, MD, Mathieu Burtnyk, PhD, William A. N’djin, PhD, Ilya Kobelevskiy, MSc, Aaron Boyes, BSc, Kashif Siddiqui, MD, Harry Foster, MD, Linda Sugar, MD, Masoom A. Haider, MD, Michael Bronskill, PhD and Laurence Klotz, MD. 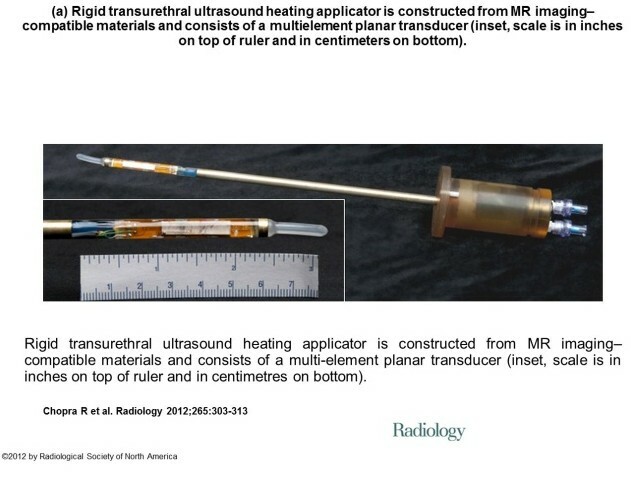 MR Imaging–controlled Transurethral Ultrasound Therapy for Conformal Treatment of Prostate Tissue: Initial Feasibility in Humans. October 2012 Radiology, 265,303-313. A promising new treatment for men with frequent nighttime urination. Answers to 8 common questions about sacral nerve stimulation for lower urinary tract symptoms. Surprising research on the link between smoking and prostate cancer recurrence. How men who drink 6 cups of coffee a day or more may reduce their risk of aggressive prostate cancer. Should you have a PSA screening test? Answers to important questions on the controversial USPSTF recommendation. Watchful waiting or radical prostatectomy for men with early-stage prostate cancer? What the research suggests. A look at state-of-the-art surveillance strategies for men on active surveillance for prostate cancer. Locally advanced prostate cancer: Will you benefit from radiation and hormones? New drug offers hope for men with metastatic castrate-resistant prostate cancer. Behavioral therapy for incontinence: Why it might be worth a try. What’s your Prostate Symptom Score? Here’s a quick quiz you can take right now to determine if you should seek treatment for your enlarged prostate. Your surgical choices: a close look at simple prostatectomy, transurethral prostatectomy and open prostatectomy. New warnings about 5-alpha-reductase inhibitors and aggressive prostate cancer. I did research in response evaluation and prediction for about 15y now and being honest: neither the clinical, nor the molecular biological data proved significant benefit in changing a strategy in patient diagnosis and / or treatment. I would state: this brings us back on the ground and not upon the sky. Additionally it means: we have to ´work harder on that and the WHO has to take responsibility: clinicians use a reponse classification without knowing, that this is just related to “ONE” experiment from the 70’s and that this experiment never had been rescrutinized (please read the Editorial I provided – we use a clinical response classification since more than 30 years worldwide (Miller et al. Cancer 1981) but it is useless ! Dr. Nir will reply to your comment. Regarding the Response Classification in use, it seems that the College of Oncology should champion a task force to revisit the Best Practice in use in this domain and issue a revised version or a new effort for a a new classification system for Clinical Response to treatment in Cancer. I’m sorry that I was looking for this paper again earlier and didn’t find it. I answered my view on your article earlier. This is a method demonstration, but not a proof of concept by any means. It adds to the cacophany of approaches, and in a much larger study would prove to be beneficial in treatment, but not a cure for serious prostate cancer because it is unlikely that it can get beyond the margin, and also because there is overtreatment at the cutoff of PSA at 4.0. There is now a proved prediction model that went to press some 4 months ago. I think that the pathologist has to see the tissue, and the standard in pathology now is for any result that is cancer, two pathologist or a group sitting together should see it. It’s not an easy diagnosis. Björn LDM Brücher, Anton Bilchik, Aviram Nissan, Itzhak Avital, & Alexander Stojadinovic. Tumor response criteria: are they appropriate? Future Oncol. (2012) 8(8), 903–906. 10.2217/FON.12.78. ISSN 1479-6694. ..Tumor heterogeneity is a ubiquitous phemomenon. In particular, there are important differences among the various types of gastrointestinal (GI) cancers in terms of tumor biology, treatment response and prognosis. ..This forms the principal basis for targeted therapy directed by tumor-specific testing at either the gene or protein level. Despite rapid advances in our understanding of targeted therapy for GI cancers, the impact on cancer survival has been marginal. ..Can tumor response to therapy be predicted, thereby improving the selection of patients for cancer treatment? ..We must rethink how we may better determine treatment response in a reliable, reproducible way that is aimed at individualizing the therapy of cancer patients. ..we must change the tools we use to assess tumor response. The new modality should be based on empirical evidence that translates into relevant and meaningful clinical outcome data. ..This becomes a conundrum of sorts in an era of ‘minimally invasive treatment’. Several years ago i heard Stamey present the totality of his work at Stanford, with great disappointment over hsPSA that they pioneered in. The outcomes were disappointing. I had published a review of all of our cases reviewed for 1 year with Marguerite Pinto. There’s a reason that the physicians line up outside of her office for her opinion. The review showed that a PSA over 24 ng/ml is predictive of bone metastasis. Any result over 10 was as likely to be prostatitis, BPH or cancer. I did an ordinal regression in the next study with Gustave Davis using a bivariate ordinal regression to predict lymph node metastasis using the PSA and the Gleason score. It was better than any univariate model, but there was no followup. I reviewed a paper for Clin Biochemistry (Elsevier) on a new method for PSA, very different than what we are familiar with. It was the most elegant paper I have seen in the treatment of the data. The model could predict post procedural time to recurrence to 8 years. I hope we are in agreement on the fact that imaging guided interventions are needed for better treatment outcome. The point I’m trying to make in this post is that people are investing in developing imaging guided intervention and it is making progress. Over diagnosis and over treatment is another issue altogether. I think that many of my other posts are dealing with that. Tumor response criteria: are they appropriate? Tumor heterogeneity is a problematic because of differences among the metabolic variety among types of gastrointestinal (GI) cancers, confounding treatment response and prognosis. 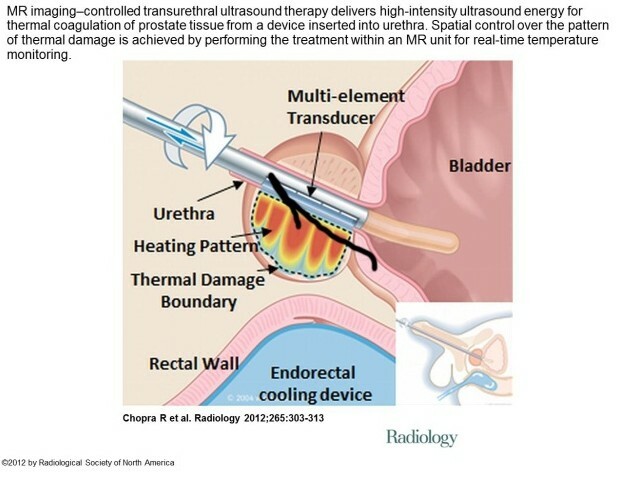 This is in response to … a group of investigators from Sunnybrook Health Sciences Centre, University of Toronto, Ontario, Canada who evaluate the feasibility and safety of magnetic resonance (MR) imaging–controlled transurethral ultrasound therapy for prostate cancer in humans. Their study’s objective was to prove that using real-time MRI guidance of HIFU treatment is possible and it guarantees that the location of ablated tissue indeed corresponds to the locations planned for treatment. 1. There is a difference between expected response to esophageal or gastric neoplasms both biologically and in expected response, even given variability within a class. The expected time to recurrence is usually longer in the latter case, but the confounders are – age at time of discovery, biological time of detection, presence of lymph node and/or distant metastasis, microscopic vascular invasion. 2. There is a long latent period in abdominal cancers before discovery, unless a lesion is found incidentally in surgery for another reason. 3. The undeniable reality is that it is not difficult to identify the main lesion, but it is difficult to identify adjacent epithelium that is at risk (transitional or pretransitional). Pathologists have a very good idea about precancerous cervical neoplasia. The heterogeneity rests within each tumor and between the primary and metastatic sites, which is expected to be improved by targeted therapy directed by tumor-specific testing. Despite rapid advances in our understanding of targeted therapy for GI cancers, the impact on cancer survival has been marginal. The heterogeneity is a problem that will take at least another decade to unravel because of the number of signaling pathways and the crosstalk that is specifically at issue. I must refer back to the work of Frank Dixon, Herschel Sidransky, and others, who did much to develop a concept of neoplasia occurring in several stages – minimal deviation and fast growing. These have differences in growth rates, anaplasia, and biochemical. This resembles the multiple “hit” theory that is described in “systemic inflammatory” disease leading to a final stage, as in sepsis and septic shock. In 1920, Otto Warburg received the Nobel Prize for his work on respiration. He postulated that cancer cells become anaerobic compared with their normal counterpart that uses aerobic respiration to meet most energy needs. He attributed this to “mitochondrial dysfunction. In fact, we now think that in response to oxidative stress, the mitochondrion relies on the Lynen Cycle to make more cells and the major source of energy becomes glycolytic, which is at the expense of the lean body mass (muscle), which produces gluconeogenic precursors from muscle proteolysis (cancer cachexia). There is a loss of about 26 ATP ~Ps in the transition. The mitochondrial gene expression system includes the mitochondrial genome, mitochondrial ribosomes, and the transcription and translation machinery needed to regulate and conduct gene expression as well as mtDNA replication and repair. Machinery involved in energetics includes the enzymes of the Kreb’s citric acid or TCA (tricarboxylic acid) cycle, some of the enzymes involved in fatty acid catabolism (β-oxidation), and the proteins needed to help regulate these systems. The inner membrane is central to mitochondrial physiology and, as such, contains multiple protein systems of interest. These include the protein complexes involved in the electron transport component of oxidative phosphorylation and proteins involved in substrate and ion transport. Mitochondrial roles in, and effects on, cellular homeostasis extend far beyond the production of ATP, but the transformation of energy is central to most mitochondrial functions. Reducing equivalents are also used for anabolic reactions. The energy produced by mitochondria is most commonly thought of to come from the pyruvate that results from glycolysis, but it is important to keep in mind that the chemical energy contained in both fats and amino acids can also be converted into NADH and FADH2 through mitochondrial pathways. The major mechanism for harvesting energy from fats is β-oxidation; the major mechanism for harvesting energy from amino acids and pyruvate is the TCA cycle. Once the chemical energy has been transformed into NADH and FADH2 (also discovered by Warburg and the basis for a second Nobel nomination in 1934), these compounds are fed into the mitochondrial respiratory chain. The hydroxyl free radical is extremely reactive. It will react with most, if not all, compounds found in the living cell (including DNA, proteins, lipids and a host of small molecules). The hydroxyl free radical is so aggressive that it will react within 5 (or so) molecular diameters from its site of production. The damage caused by it, therefore, is very site specific. The reactions of the hydroxyl free radical can be classified as hydrogen abstraction, electron transfer, and addition. The formation of the hydroxyl free radical can be disastrous for living organisms. Unlike superoxide and hydrogen peroxide, which are mainly controlled enzymatically, the hydroxyl free radical is far too reactive to be restricted in such a way – it will even attack antioxidant enzymes. Instead, biological defenses have evolved that reduce the chance that the hydroxyl free radical will be produced and, as nothing is perfect, to repair damage. Currently, some endogenous markers are being proposed as useful measures of total “oxidative stress” e.g., 8-hydroxy-2’deoxyguanosine in urine. The ideal scavenger must be non-toxic, have limited or no biological activity, readily reach the site of hydroxyl free radical production (i.e., pass through barriers such as the blood-brain barrier), react rapidly with the free radical, be specific for this radical, and neither the scavenger nor its product(s) should undergo further metabolism. Nitric oxide has a single unpaired electron in its π*2p antibonding orbital and is therefore paramagnetic. This unpaired electron also weakens the overall bonding seen in diatomic nitrogen molecules so that the nitrogen and oxygen atoms are joined by only 2.5 bonds. The structure of nitric oxide is a resonance hybrid of two forms. In living organisms nitric oxide is produced enzymatically. Microbes can generate nitric oxide by the reduction of nitrite or oxidation of ammonia. In mammals nitric oxide is produced by stepwise oxidation of L-arginine catalyzed by nitric oxide synthase (NOS). Nitric oxide is formed from the guanidino nitrogen of the L-arginine in a reaction that consumes five electrons and requires flavin adenine dinucleotide (FAD), flavin mononucleotide (FMN) tetrahydrobiopterin (BH4), and iron protoporphyrin IX as cofactors. The primary product of NOS activity may be the nitroxyl anion that is then converted to nitric oxide by electron acceptors. The thiol-disulfide redox couple is very important to oxidative metabolism. GSH is a reducing cofactor for glutathione peroxidase, an antioxidant enzyme responsible for the destruction of hydrogen peroxide. Thiols and disulfides can readily undergo exchange reactions, forming mixed disulfides. Thiol-disulfide exchange is biologically very important. For example, GSH can react with protein cystine groups and influence the correct folding of proteins, and it GSH may play a direct role in cellular signaling through thiol-disulfide exchange reactions with membrane bound receptor proteins (e.g., the insulin receptor complex), transcription factors (e.g., nuclear factor κB), and regulatory proteins in cells. Conditions that alter the redox status of the cell can have important consequences on cellular function. So the complexity of life is not yet unraveled. Can tumor response to therapy be predicted, thereby improving the selection of patients for cancer treatment? •	type of antitumor therapy and the time when response was determined. The new modality should be based on individualized histopathology as well as tumor molecular, genetic and functional characteristics, and individual patients’ characteristics, a greater challenge in an era of ‘minimally invasive treatment’. This listing suggests that for every cancer the following data has to be collected (except doubling time). If there are five variables, the classification based on these alone would calculate to be very sizable based on Eugene Rypka’s feature extraction and classification. But looking forward, time to remission and disease free survival are additionally important. Treatment for cure is not the endpoint, but the best that can be done is to extend the time of survival to a realistic long term goal and retain a quality of life. Brücher BLDM, Piso P, Verwaal V et al. Peritoneal carcinomatosis: overview and basics. Cancer Invest.30(3),209–224 (2012). Brücher BLDM, Swisher S, Königsrainer A et al. Response to preoperative therapy in upper gastrointestinal cancers. Ann. Surg. Oncol.16(4),878–886 (2009). Miller AB, Hoogstraten B, Staquet M, Winkler A. Reporting results of cancer treatment. Cancer47(1),207–214 (1981). Therasse P, Arbuck SG, Eisenhauer EA et al. New guidelines to evaluate the response to treatment in solid tumors. European Organization for Research and Treatment of Cancer, National Cancer Institute of the United States, National Cancer Institute of Canada. J. Natl Cancer Inst.92(3),205–216 (2000). Brücher BLDM, Becker K, Lordick F et al. The clinical impact of histopathological response assessment by residual tumor cell quantification in esophageal squamous cell carcinomas. Cancer106(10),2119–2127 (2006). Please carry it as a stand alone post, Dr. Ritu will refer to it and reference it in her FORTHCOMING pst on Tumor Response which will integrate multiple sources. Thank you Larry for this educating comment. It explains very well why the Canadian investigators did not try to measure therapy response! What they have demonstrated is the technological feasibility of coupling a treatment device to an imaging device and use that in order to guide the treatment to the right place. the issue of “choice of treatment” to which you are referring is not in the scope of this publication. The point is: if one treatment modality can be guided, other can as well! This should encourage others, to try and develop imaging-based treatment guidance systems. The crux of the matter in terms of capability is that the cancer tissue, adjacent tissue, and the fibrous matrix are all in transition to the cancerous state. It is taught to resect leaving “free margin”, which is better aesthetically, and has had success in breast surgery. The dilemma is that the patient may return, but how soon? Correct. The philosophy behind lumpectomy is preserving quality of life. It was Prof. Veronesi (IEO) who introduced this method 30 years ago noticing that in the majority of cases, the patient will die from something else before presenting recurrence of breast cancer.. It is well established that when the resection margins are declared by a pathologist (as good as he/she could be) as “free of cancer”, the probability of recurrence is much lower than otherwise. Great post! Dr. Nir, can the ultrasound be used in conjunction with PET scanning as well to determine a spatial and functional map of the tumor. With a disease like serous ovarian cancer we typically see an intraperitoneal carcimatosis and it appears that clinicians are wanting to use fluorogenic probes and fiberoptics to visualize the numerous nodules located within the cavity Also is the technique being used mainy for surgery or image guided radiotherapy or can you use this for detecting response to various chemotherapeutics including immunotherapy. Ultrasound can and is actually used in conjunction with PET scanning in many cases. The choice of using ultrasound is always left to the practitioner! Being a non-invasive, low cost procedure makes the use of ultrasound a non-issue. The down-side is that because it is so easy to access and operate, nobody bothers to develop rigorous guidelines about using it and the benefits remains the property of individuals. 1. VAES (E.), MANCHANDA (R), AUTIER, NIR (R), NIR (D.), BLEIBERG (H.), ROBERT (A. ), MENON (U.). Differential diagnosis of adnexal masses: Sequential use of the Risk of Malignancy Index and a novel computer aided diagnostic tool. Published in Ultrasound in Obstetrics & Gynecology. Issue 1 (January). Vol. 39. Page(s): 91-98. 2. VAES (E.), MANCHANDA (R), NIR (R), NIR (D.), BLEIBERG (H.), AUTIER (P.), MENON (U. ), ROBERT (A.). Mathematical models to discriminate between benign and malignant adnexal masses: potential diagnostic improvement using Ovarian HistoScanning. Published in International Journal of Gynecologic Cancer (IJGC). Issue 1. Vol. 21. Page(s): 35-43. 3. LUCIDARME (0. ), AKAKPO (J.-P.), GRANBERG (S.), SIDERI (M.), LEVAVI (H.), SCHNEIDER (A. ), AUTIER (P.), NIR (D.), BLEIBERG (H.). A new computer aided diagnostic tool for non-invasive characterisation of malignant ovarian masses: Results of a multicentre validation study. Published in European Radiology. Issue 8. Vol. 20. Page(s): 1822-1830.
totally true and i am very thankfull for these briliant comments. Remember: 10years ago: every cancer researcher stated: “look at the tumor cells only – forget the stroma”. The era of laser-captured tumor-cell dissection started. Now , everyone knows: it is a system we are looking at and viewing and analyzing tumor cells only is really not enough. So if we would be honest, we would have to declare, that all data, which had been produced 13-8years ago, dealing with laser capture microdissection, that al these data would need a re-scrutinization, cause the influence of the stroma was “forgotten”. I ‘d better not try thinking about the waisted millions of dollars. If we keep on being honest: the surgeon looks at the “free margin” in a kind of reductionable model, the pathologist is more the control instance. I personally see the pathologist as “the control instance” of surgical quality. Therefore, not the wish of the surgeon is important, the objective way of looking into problems or challenges. 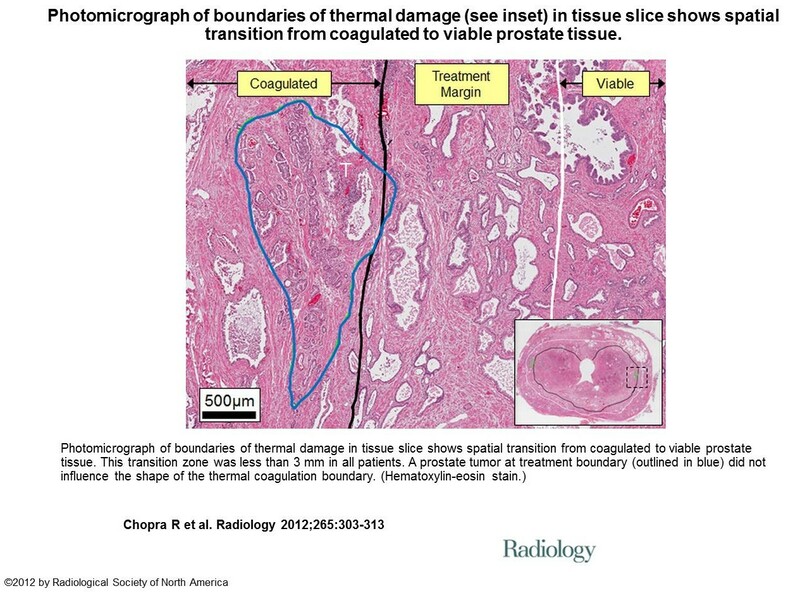 Can a pathologist always state, if a R0-resection had been performed ? There had been many many surrogate marker analysis – nothing new. BUT never a real substantial well tought through structured analysis had been done: mm by mm by mm by mm and afterwards analyzing that by a ROC analysis. BUt against which goldstandard ? If you perform statistically a ROC analysis – you need a golstandard to compare to. Therefore what is the real R0-resectiòn? It had been not proven. It just had been stated in this or that tumor entity that this or that margin with this margin free mm distance or that mm distance is enough and it had been declared as “the real R0-classification”. In some organs it is very very difficult and we all (surgeons, pathologists, clinicians) that we always get to the limit, if we try interpretating the R-classification within the 3rd dimension. Often it is just declared and stated. Otherwise: if lymph nodes are negative it does not mean, lymph nodes are really negative, cause up to 38% for example in upper GI cancers have histological negative lymph nodes, but immunohistochemical positive lymph nodes. And this had been also shown by Stojadinovic at el analyzing the ultrastaging in colorectal cancer. So the 4th dimension of cancer – the lymph nodes / the lymphatic vessel invasion are much more important than just a TNM classification, which unfortunately does often not reflect real tumor biology. AS we see: cancer has multifactorial reasons and it is necessary taking the challenge performing high sophisticated research by a multifactorial and multidisciplinary manner. Again my deep and heartly thanks for that productive and excellent discussion ! Multidisciplinary perspectives have illuminated the discussion on the pages of this Journal. Thank you BB for your comment. You have touched the core limitation of healthcare professionals: how do we know that we know! Do we have a reference to each of the test we perform? Do we have objective and standardise quality measures? Do we see what is out-there or are we imagining? But still, in the last decades, lots of progress was made…. 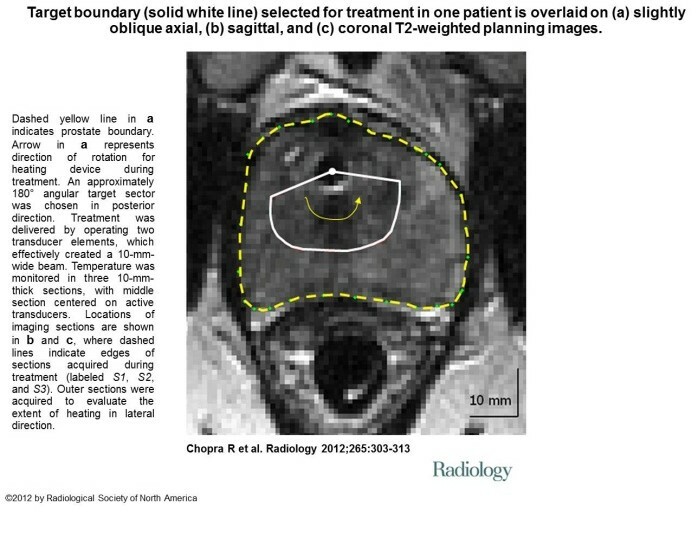 The paper that you have discussed had the objective of finding out whether real-time MRI guidance of treatment was even possible and if yes, and also if the treatment could be performed in accurate location of the ROI? The data reveals they were pretty successful in accomplishing their objective and of course that gives hope to the imaging-based targeted therapies. Whether the ROI is defined properly and if it accounts for the real tumor cure, is a different question. Role of pathologists and the histological analysis they bring about to the table cannot be ruled out, and the absence of a defined line between the tumor and the stromal region in the vicinity is well documented. However, that cannot rule out the value and scope of imaging-based detection and targeted therapy. After all, it is seminal in guiding minimally invasive surgery. As another arm of personalized medicine-based cure for cancer, molecular biologists at MD Anderson have suggested molecular and genetic profiling of the tumor to determine genetic aberrations on the basis of which matched-therapy could be recommended to patients. When phase I trial was conducted, the results were obtained were encouraging and the survival rate was better in matched-therapy patients compared to unmatched patients. Therefore, everytime there is more to consider when treating a cancer patient and who knows a combination of views of oncologists, pathologists, molecular biologists, geneticists, surgeons would device improvised protocols for diagnosis and treatment. It is always going to be complicated and generalizations would never give an answer. 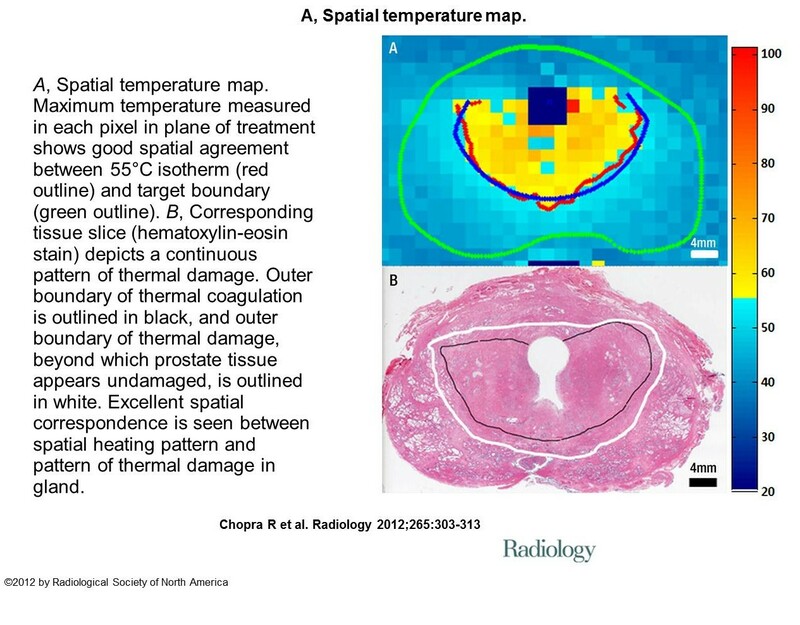 Smart interpretations of therapies – imaging-based or others would always be required! One of your earlier comments, mentioned the non invasiveness of ultrasound, thus, it’s prevalence in use for diagnosis. This may be true for other or all areas with the exception of Mammography screening. In this field, an ultrasound is performed only if a suspected area of calcification or a lump has been detected in the routine or patient-initiated request for ad hoc mammography secondery to patient complain of pain or patient report of suspected lump. Ultrasound in this field repserents ascalation and two radiologists review. It in routine use for Breast biopsy. Thanks Ritu for this supporting comment. The worst enemy of finding solutions is doing nothing while using the excuse of looking for the “ultimate solution” . Personally, I believe in combining methods and improving clinical assessment based on information fusion. Being able to predict, and then timely track the response to treatment is a major issue that affects survival and costs!